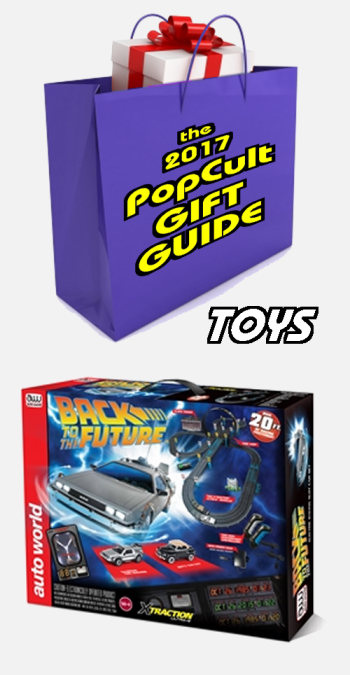 Who out there doesn’t long to take just one gigawatt blasting’ spin in the awesome Back to the Future Time Machine? 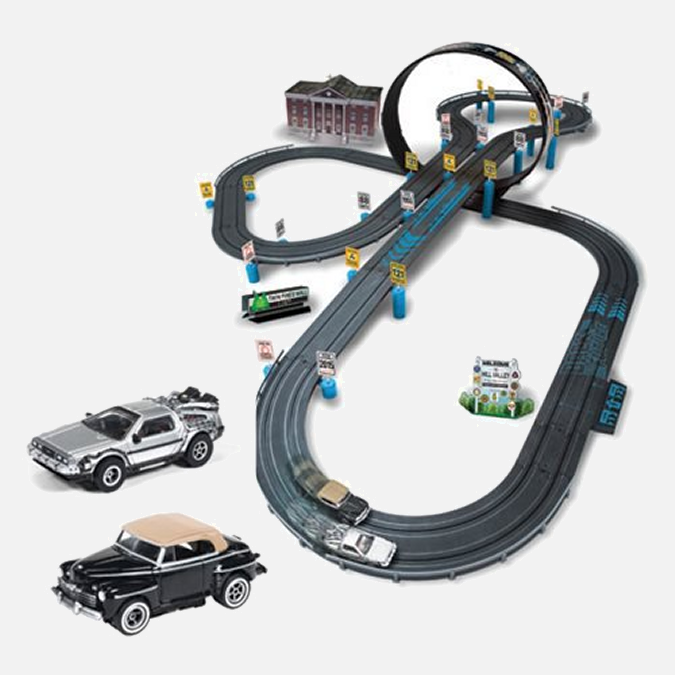 With this Back to the Future Electric Slot Car Race Set, you can relive all of the g-force excitement of time travel. Race around the huge 20-foot track with Marty McFly’s DeLorean Time Machine and Biff Tannen’s 1946 Ford in one of the 2 exclusive X-Traction slot cars included in this set. Great Scott a race-set this exciting could only be invented by those mad scientists at Auto World! The 20 feet of track features multiple curves and a time loop. Clock Tower cardboard building and road signs included. X-Traction cars are reinventions of the 1970s AFX racing slot cars, with improved engineering, but old-school play value. The controllers are pistol-grip style controllers like the original sets, and the cars handle spectacularly. And those cars are really nice replicas of the cars from the movie, so it’s perfect for kids, adults who grew up with slot cars and for die-hard fans of Back To The Future. This is the most affordable Delorean that you’ll ever find. This set can be found in some hobby shops, or it can ordered from Amazon, or directly from AutoWorld. If you order it from AutoWorld, be advised that it qualifies for free shipping, and if you order over $150 (meaning one penny more than this set), you can get fifteen percent off with the code “holiday15” until November 23. They have tons of cool stuff, including many cars that are compatible with this set, so feel free to splurge. At over a hundred bucks, it may seem a bit pricey, but the joy of slot car racing is worth it.